As you all know by now, I'm a crazy Harry Potter fan. I throw a huge party every July for Harry Potter's birthday and my house is decorated like Hogwarts from then through January 1st. That said, we finally made our way back to Universal Studios Orlando to check out the expansion to Wizarding World. This is the second time we've been since they opened Hogsmeade and the additions were something to behold. Obviously, you want to start there, because that's where Hogswarts is. The castle looms over Hogsmeade and is very dramatic, especially when you head inside to get in line for Harry Potter and the Forbidden Journey. 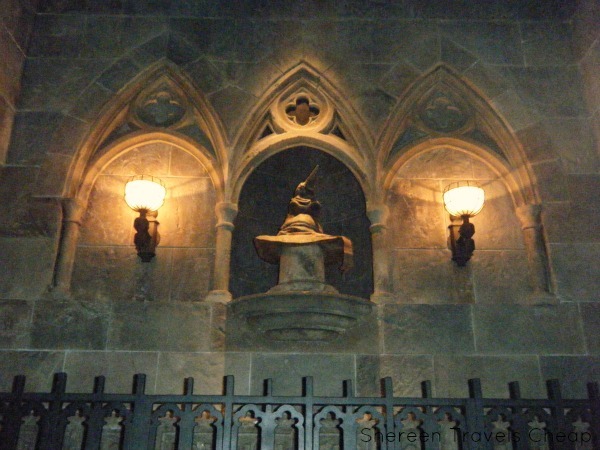 The ride is a 4D journey through Hogwarts and the castle grounds with Harry, Ron and Hermione, but the line itself is worth waiting in, because there's so much to see. 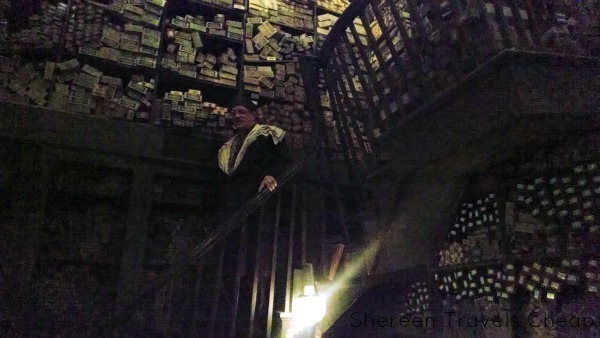 You'll come in through the Greenhouses, pass through the potions classroom, Dumbledore's office, walk past the house hourglasses and many other staples of the books and movies. Watch the portraits talk to each other, meet the Fat Lady, check out the class notice board and listen to the wisdom of the Sorting Hat. I know he should be in Dumbledore's office, but his prominent place in the hallway gives you a chance to really appreciate him and his songs and rhymes. The ride itself can be scary for younger visitors, as Dementors and Acromantulas make an appearance and come pretty close to you. 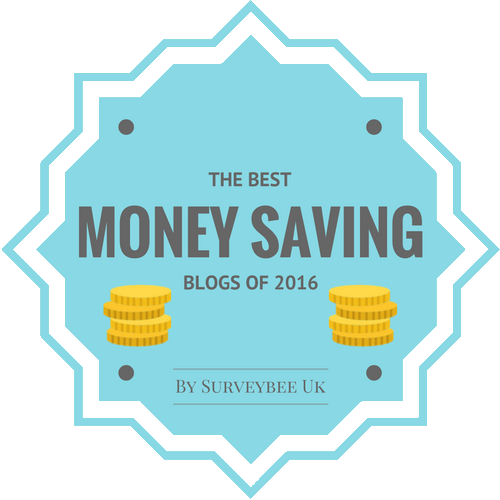 The car dips, swerves and flies and may not be great if you get motion sickness easily. In fact, I wouldn't suggest eating right before you get on it, because it can make even the most stable of us ill feeling. The way the car is situated, you are locked in like a roller coaster, but you have separators between you and the other three riders, so you can basically only see what's right in front of you, which can be disorienting, especially when you're turned nearly upside down. 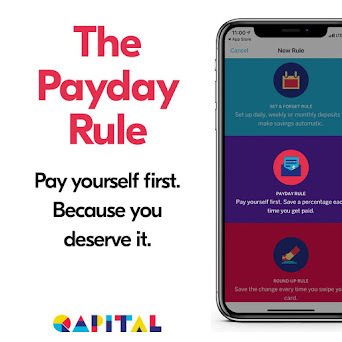 If that doesn't bother you, you're going to have a great time. You'll end the ride in a gift shop, because why wouldn't you? In this case, it's Filch's Emporium, which combines some awesome Harry Potter merch that you can't find elsewhere in the park and all those confiscated goods from Hogwarts students throughout the years. It's like a combination of Filch's office and the Room of Requirement, with piles of books, student files and cages full of things those kids aren't likely to get back (see them up along the ceiling?). Across the hallway, you'll find complimentary lockers where you can put your loose articles, which aren't allowed on the ride. 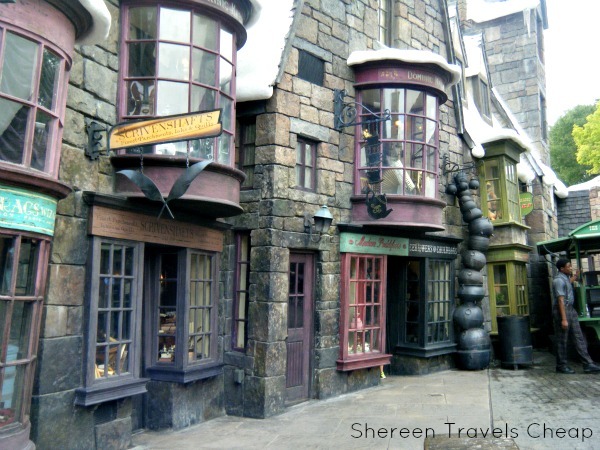 Looking for a wand or some Harry Potter souvenirs? 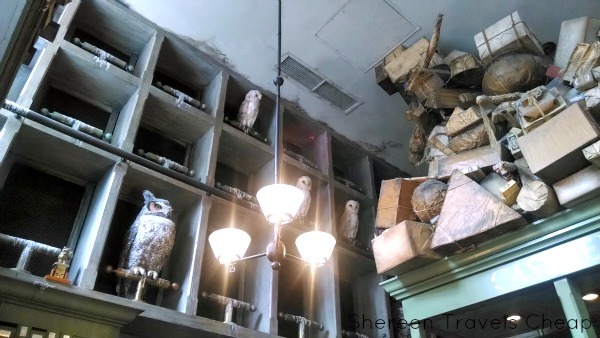 Check out the Owl Emporium, which is attached to Ollivander's Wand Shop. Here you can see the owls that deliver post all over the Wizarding World, along with heaps of packages waiting to be sent. You always want to look up when you're in the Wizarding World, because if you don't, you'll be missing out on a lot. 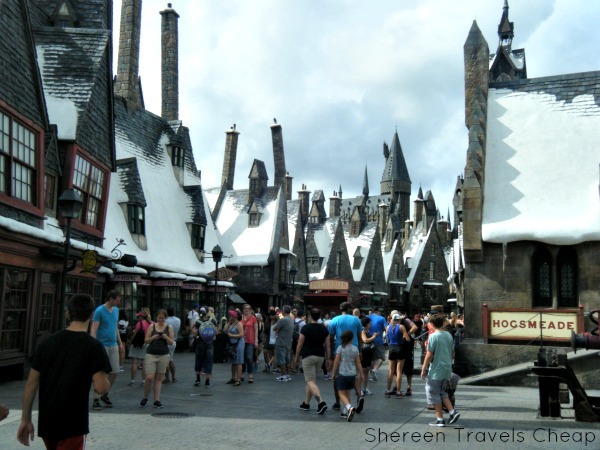 Hogsmeade is permanently cloaked in a blanket of snow, just as you see it in the movies. Of course, when it's 108 degrees out, it's a bit misleading, but maybe that's how people are walking around all day in their wool blend wizard cloaks. I know I couldn't do it. I barely wanted to wear sleeves. Are you in the market for a wand? I certainly was, especially since you can buy an interactive wand that will work at over 25 places in Hogsmeade and Diagon Alley to perform real magic. Well, you know "real" is subjective, but the beauty of Wizarding World of Harry Potter is that it feels like you're actually in the books. 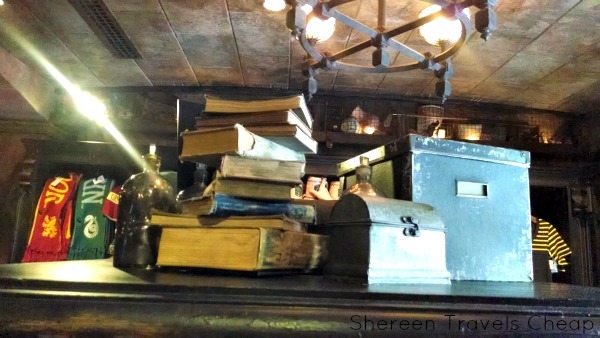 Head to Ollivander's to watch a wizard get chosen for a wand to choose them. Maybe it'll be you. The show is short and the shop is very small, but there are wand boxes from floor to ceiling here. The actor that plays Ollivander chooses several wands for the volunteer to try out and only stops when they find the perfect one. Cue whirlwind, sparkling lights and swelling music. Once the show is over, everyone else is ushered through the door to the Owl Emporium where you can purchase your own wand if you choose. Pick a replica of your favorite character's wand, let your birth date choose for you or do what I did and get the one that feels perfect in your hand. Mine turned out to be hazel. My birthday would have given me a Death Eater wand with a skull on the handle. It seemed really large and unlike me, so I passed. The interactive wands are only $10 more than the regular wands, so there's really no reason to not get one if you're buying a wand anyway. 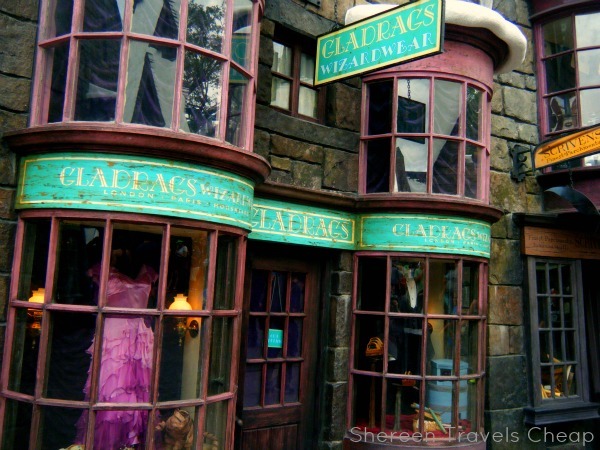 I adore the Wizarding World and the shops are phenomenal from the outside. 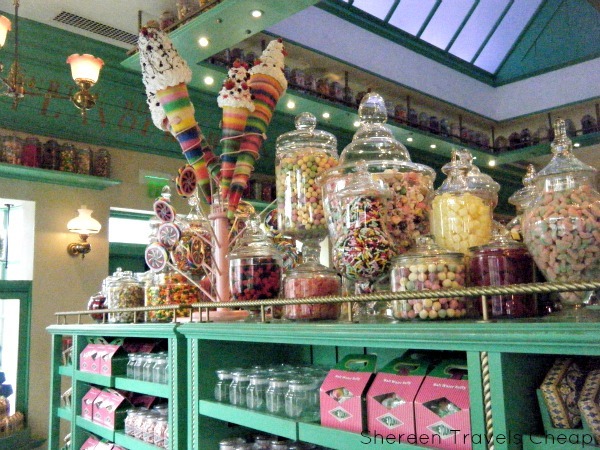 Many of them blend into one another and are cramped on the inside, but that doesn't stop you from wanting to check out all their goods, especially in Honeydukes where there are tons of delicious sweets, including giant Chocolate Frogs and boxes of Bertie Bott's Every Flavour Beans. With your newly acquired wand, look for gold medallions on the ground outside shops to know where you can do magic. Each medallion (as well as the map that comes with every interactive wand) shows you the spell to use and the movements to do with your wand to accomplish it. If you're having trouble, usually there is a lovely wizard nearby to help you out. Like with all spells, some are more complicated than others, but practice makes perfect. 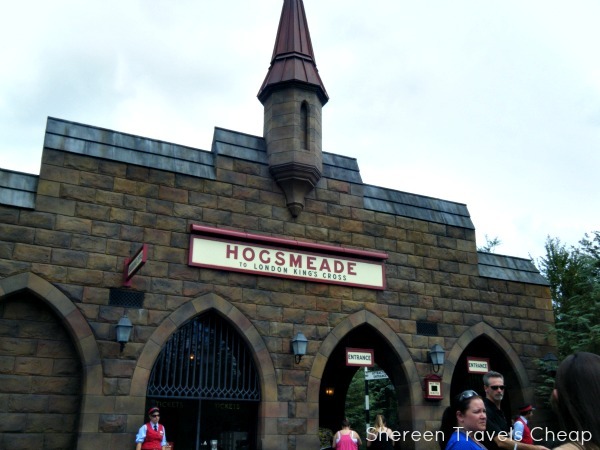 Though there aren't a lot of rides in the Wizarding World, there are three in Hogsmeade (not including the train to London and Diagon Alley). 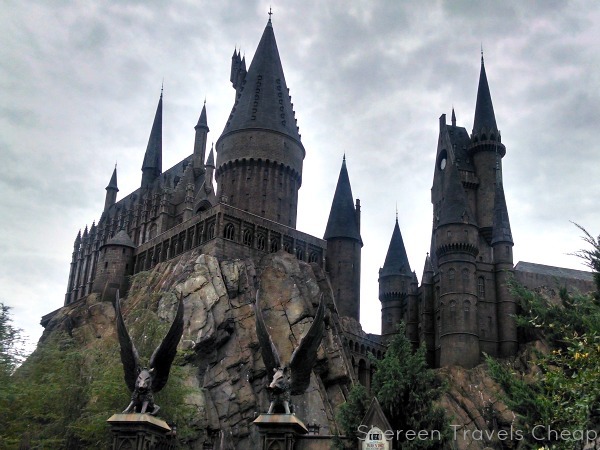 Forbidden Journey, Dragon Challenge and Flight of the Hippogriff. 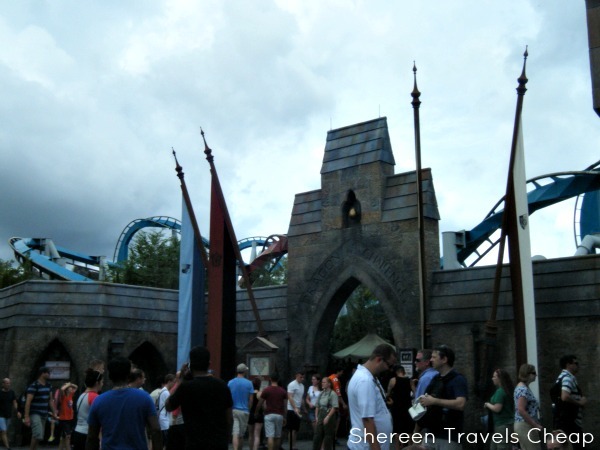 Dragon Challenge is a traditional roller coaster that pits two "dragons" against each other (when the crowds are large) and is themed for the Triwizard Tournament. 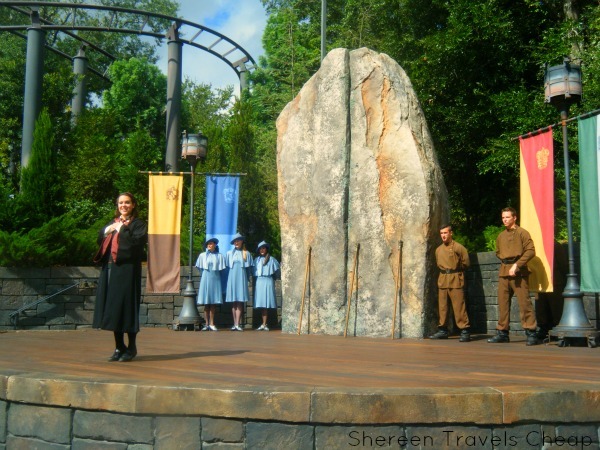 View the Goblet of Fire, the chapion's tent and the Triwizard Cup. This, too, is housed in a castle like structure, which can get dark and spooky. I saw more than one person jump when a person came around a blind corner or remark on the low light levels. 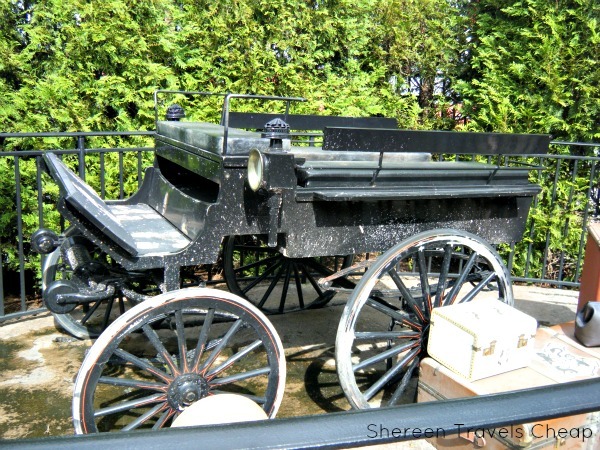 You can't bring anything with you on this ride, though there are a ton of photo opps inside and out, You'll go through a metal detector to ensure your pockets are empty of anything that would fall out and hit someone else. To make up for the lack of rides in Hogsmeade, you've got the opportunity to see a few live shows including the singing Frog Choir. They showed up in line for Dragon Challenge and I was unable to snap a pic, but it was a fun surprise. The Triwizard Challenge is another live show. It's not long or involved, but you can see the students of Durmstrang and Beauxbaton showcase their skills. The Beauxbatons dance and twirl while the Durmstrang guys show off their fighting techniques. Obviously, they aren't well-matched, but it was still fun to watch. 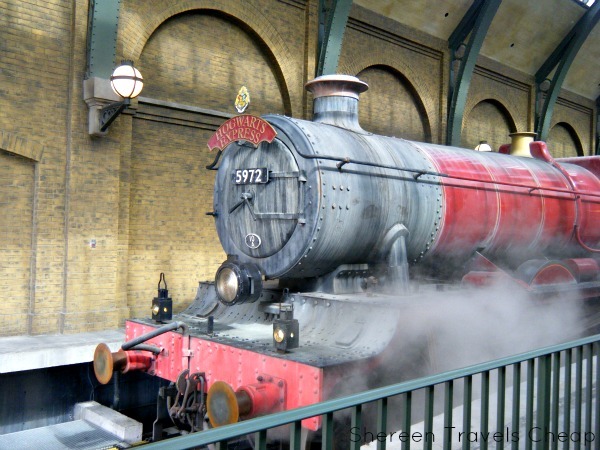 Once you've seen everything you can see in Hogsmeade, head to the train station where you can take the Hogwarts Express to London and Diagon Alley. Make sure you make the return trip, too, because both ways are different (as you would expect on the actual train). We adored the train. 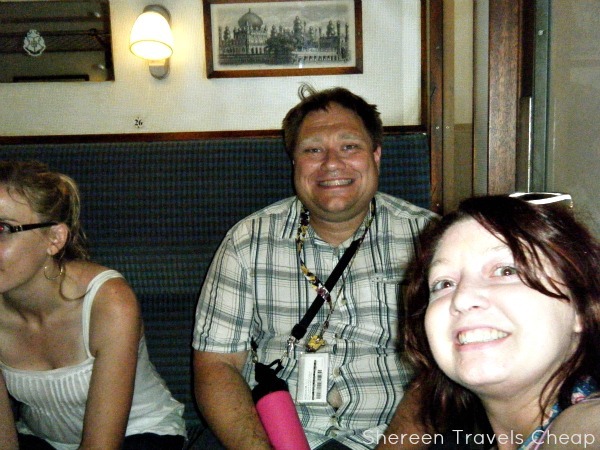 It was like actually getting on the real Hogwarts Express, without the option of making a purchase from the food trolley. 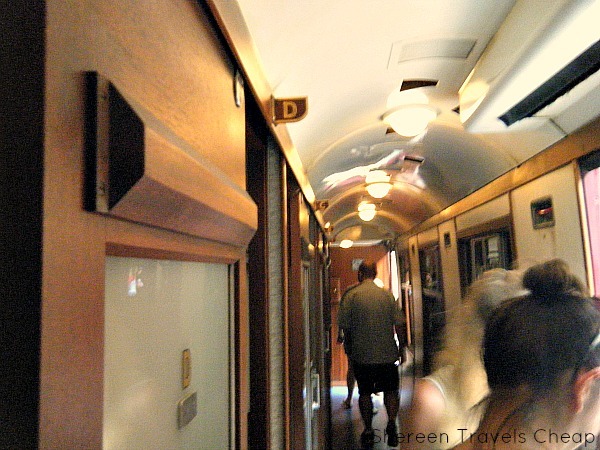 You board your own compartment (up to 8 people will fit in one) where you'll see the landscape change outside the "window". 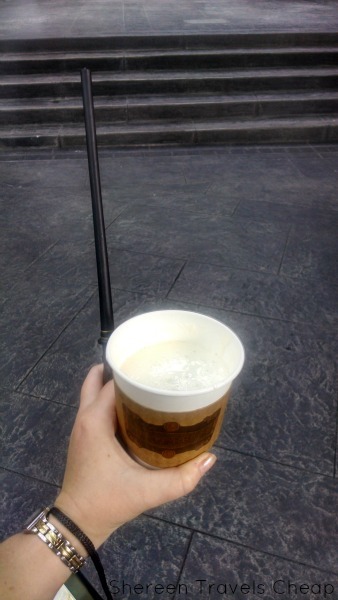 Stay tuned for the Diagon Alley portion of my trip and a post all on foods and treats. What's your favorite character, place or food from Harry Potter?